Taken from New Vintage Lace: "This piece was inspired by a doily in the Burda publication from the 1950s that's no longer in print. Including a fun texture and mesh fill, this shawl be one of the more challenging pieces in this book. But its also one of the most fun to knit! The small blossoms or fruit are created by increasing several stitches at once, then decreasing them a few rows later." 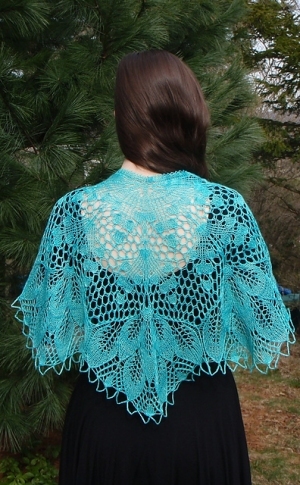 This pattern is from New Vintage Lace, pg 83 - Nereid. Size US 5 - 32" circular needles (or size needed to obtain gauge), beads, crochet hook size to fit beads, scrap yarn, stitch markers, a tapestry needle, flexible blocking wires, and T-pins are required but not included. Finished Measurements: 19" x 43" after blocking. Gauge: 12 sts and 12 rows over 4". Color Shown is Alvina Aqua. $21.60 -- Kit price including yarn only (no book or pattern).